For £600 and change, this is a whole lotta bass. Cars and wine are always useful analogies when reviewing bass guitars, we find. A £5000 instrument is comparable to a Ferrari F40 or 1956 Château d’Yquem. A £100 bass can be likened to a 1989 Mazda or a £2.99 merlot from Lidl. You get the picture... but just to confuse the issue, here’s a bass with a pricetag that says ‘2018 Volkswagen’, that has the looks of a 1960s Camaro and the feel of a 1970s Mercedes. What’s your simile-fixated reviewer to do? The Esprit’s bodyshape is a love-it-or-hate-it affair, especially when combined with that pearlescent-effect scratchplate and vintage gold controls. We think it’s rather cool, perhaps invigorated by the observation of a certain G. Lee that a lot of vintage bass design was inspired by mid-20th century accordions. The headstock is a bit of a lump, though, and with those chunky elephant-ear tuners from Wilkinson on board there’s the tiniest bit of headstock dive - not enough to get stressed about, though. The bridge is pretty standard and the fine details are just as you’d expect, but the pickup is a curious affair called a WJM double coil. Fret-King describes the unit with a refreshing absence of modesty as a “Wilkinson masterpiece...a profound and powerful pickup which will hold its own in every musical style.” Sounds promising. Turn the ignition (or pop the cork, if you prefer) with the passive EQ set at halfway, and the Esprit immediately comes at you with a crunchy, pleasant tone. You might want to roll it off towards the bass end for a bit more thump, as the sound is lean and slightly toppy even before you start messing around with the other tone control, labelled the ‘Vari-coil’. Even if the bass had only one EQ option, it would still enjoy one of the most useful ranges we’ve come across for its relatively measly cost. Tweak the Vari-coil anyway and see what it does; it seems to be essentially about adding some punch in the mids. It does this well, but frankly it’s not really needed; the basic tone is good enough. The Esprit is easy to play for those prone to aching picking hands, because your arm rests on the extended upper bout. Gibson Explorer players have known about this for decades. The 22-fret, Precision-y neck somehow feels longer than its 34” scale would suggest (no bad thing) and is easily navigated thanks to its slinky rear finish. This, combined with a super-low action on the review model, is a relief - the hefty Esprit would be a bit of a workout otherwise. 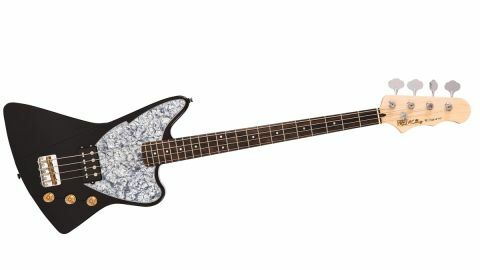 This is that desirable product, a bass guitar with potential that belies its pricetag. It’s a highly enjoyable low-mid-market instrument as far as we’re concerned. As for cars and wine, let’s mix metaphors. This bass combines classic taste with a modern engine. You’ll enjoy the Esprit experience from either viewpoint.